Thus far the IMU and Master Brick did use 9mm stack connectors, while all other Bricks (DC, Servo, Stepper, RED) used 12mm stack connectors. The idea was to make sure that all of the modules use as little space as possible. Unfortunately there are some cases now, where the height difference between the Bricks is problematic. For example, we would need two different front panels for the Starter Kit: Server Room Monitoring to support the RED Brick (12mm distance to Ethernet Extension cut-out) as well as the Master Brick 9mm distance to Ethernet Extension cut-out). For that reason we decided to change all of the top Brick connectors to height 12mm. With this change each Brick will have the same height, which will make the development of cases a lot easier. For the mounting kits we will also only need the 12mm spacers (although for some cases 9mm spacers will still be needed). 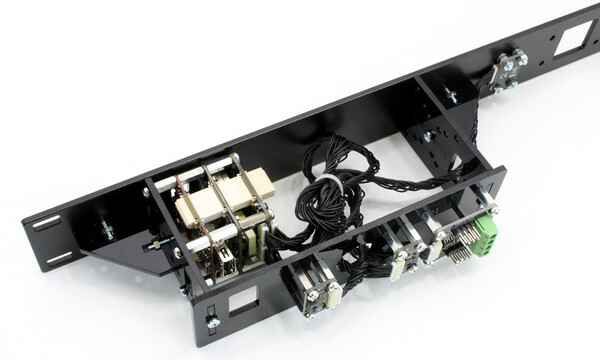 Currently the IMU Brick is the only Brick with 9mm stack connectors. It will be changed to 12mm in the next production run too. openHAB is an open source solution for home automation that supports a lot of products from different manufacturers. It is possible to view measurements with a web interface or a smartphone app (e.g. room temperature). It is also possible to control thermostats or lamps and similar. Additionally the a user can define rules that allow an autonomous control. A distinctive feature is that incompatible products from different manufacturers can interact through openHAB. A list of currently supported products can be found here. The Tinkerforge building blocks are of course supported too ;-). openHAB is now directly available on the newest RED Brick image. If the service is activated, the RED Brick can be used as a control station for home automation. 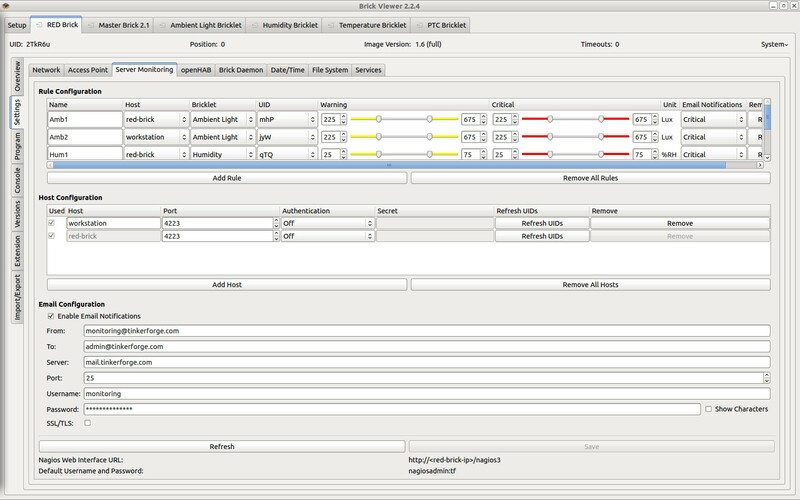 The configuration of openHAB can be done through the Brick Viewer with the help of configuration files. 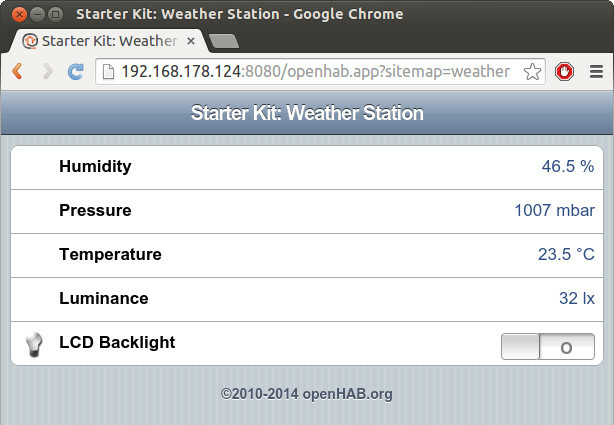 It is for example possible to control the Starter Kit: Weather Station with a RED Brick through openHAB. To demonstrate this, we added an openHAB example to the documentation of the kit. All of the important functions are implemented with the help of openHAB: The measurements are shown on the LCD (through rules) and the backlight can be toggled through the openHAB interface. This example can be used as a good starting point for openHAB, you should be able to easily integrate products from other manufacturers, such as smart lamps or remote control mains switches. Nagios is now pre-installed on the RED Brick, too. As openHAB it can be enabled as a service in Brick Viewer. Nagios is a software that can be used to monitor server installations. With the appropriate hardware you can monitor temperature, fans, load and many more measurements. If problems occurs, Nagios can for example send email notifications. If you wanted to use Nagios on an old RED Brick image, you would have to install and configure it manually. With the new image it is possible to do the configuration via mouse click. To configure Nagios you can define rules. Each rule consists of a sensor (Bricklet) and a critical- or warning-range. If a measurement is outside of the defined range, the state of the sensor will be seen as either “warning” or “critical”. For each rule it is additionally possible to declare whether and with which state a notification email should be send. Typical monitoring tasks can be automated with a few clicks in the Brick Viewer! In the new Brick Viewer version only Bricklets that are available locally (localhost) of the type Ambient Light Bricklet, Humidity Bricklet, PTC Bricklet and Temperature Bricklet are supported. The next Brick Viewer version will also support sensors that are connected to external PCs. To update to the new version you will only need to update the Brick Viewer, which will be available in approximately two weeks already. If you want to use Nagios as it is normally done, you can easily use an SSH connection or the Console tab of the Brick Viewer and do the configuration through the classical configuration files. If you have created a configuration with the Brick Viewer you can easily add your own configuration files in parallel. They will not interfere with each other. Together with the Starter Kit: Server Room Monitoring we now have a complete solution that allows to realize distributed server room monitoring without the need to do any programming or software installation. You only have to extend the kit with a RED Brick (the kit can now be ordered including a RED Brick). If you want to deploy several kits (to monitor servers at different places) you only need one kit with RED Brick. It can retrieve measurements from all of the other kits too! Many customers of the Starter Kit: Server Room Monitoring did order it together with a Humidity Bricklet. This makes a lot of sense, since humidity is supposed to be in a defined range inside of a server room. If the air is to dry, the risk of an electrostatic charge increases significantly. Thus we added the Humidity Bricklet to the default configuration of the kit. Additionally it is now possible to directly order a RED Brick together with the kit (see above). The documentation of the Starter Kit: Server Room Monitoring has been extended by an example for the usage of the RED Brick together with the Nagios service.